With regards to what might be called the "mind body connection", or the inter-relation between mind, body and spirit (the three factors that essentially constitute a complete human personality), various schools of thought have each established their particular take on the subject. And it can be put forth that a clear and proper grasp of the mind body connection can point the way to a higher and truer understanding of virtually everything that can transpire with respect to the working of the physical body. Notwithstanding the existence of various and diverse explanations on the subject of the mind body connection, only one particular explanation shall be considered here - one which the writer shall strive to put forward, in connection with what has been displayed elsewhere on this website. "You are not living in your body; the body is 'living in you', as an Idea." This may at first seem a difficult concept to grasp, since it can be put forth that, with few exceptions to the contrary, we are generally conditioned to believe that we live and operate from "within" our physical bodies - as a simple example, when we look at our reflection in a mirror. Strictly speaking, we are actually observing a reflection of our physical body when we look in a mirror. But just as we are not our physical body, there is no evidence to date that the mental or spiritual entity that we truly are - the "individualization" of Spirit or Universal Mind - resides in the physical body. As a historical note, as far back as 1907, experiments were conducted to determine the weight of a soul, via looking for a change in weight of terminally ill persons, both before and at the moment of physical death - thereby supporting the postulation that the change in weight reflected the soul departing the body - but for the most part, the results of those experiments are generally adjudged as lacking complete scientific verification. 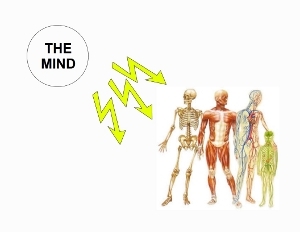 The mind body connection, as explained by a particular school of reasoning, shall be traced in so-called "reverse order", i.e., from the body to the mind. Now, it can be amply demonstrated that the atoms, molecules, tissues, etc. that constitute the physical body are, in the last analysis, simply a collection of inanimate matter. As one writer put it, you or this Author can mix together all the chemical materials that constitute the human body (which any textbook on the subject can define) in their proper proportions, but the end-result would not be a living, thinking human being. In a general sense, the body is animated (i.e., made to move in various directions) via the actions of the muscles, and in turn, the muscles are set into action by signals conveyed to them by the nerves. And, so far as the physical body itself is concerned, all indications to date suggest that these signals are generated by the brain. But it must be noted that the brain is not the mind. At best, the brain may be the primary instrument of the human body, through which the mind operates. So then, one might ask: what causes these signals to come into being? It is at this juncture, that we may recall one of the earlier discourses, regarding the postulation of the existence of a universally distributed Substance or Ether, which acts as a medium for the transmission of energy, as well as the hypothesis that Thought or Mental Action is also capable of setting into motion vibrations in Ether. So, by putting "two and two together", it is a reasonable assumption that the Mind - the entity which thinks - generates thought vibrations, which cause the generations of those signals within the brain, which in turn, inevitably set the physical body into motion, according to the thought of the Mind. At the same time, it is necessary to work out some reasonable hypothesis to explain how the Mind - a non-physical entity - can ultimately transmit its thought vibrations to initiate movement in the physical body. 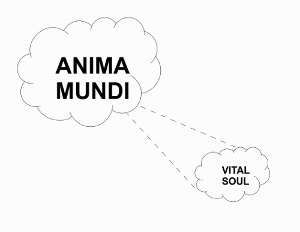 In a general sense, the Vital Soul may be defined as a human being's personal share of the Impersonal Soul of the Universe, or Anima Mundi - in similar manner as the Human Mind may be considered an individualization of the Universal Mind. And, as was stated in the discourse on the subject, Anima Mundi is an impersonal element, i.e., it has no conscious thinking ability in itself. Likewise, the Vital Soul in like manner does not consciously think. Rather, the Vital Soul is may be said to be generally impressed with "race-consciousness", i.e., the cumulative beliefs, ideas and opinions entertained by the mass of mankind. At the same time, in similar manner as Animus Dei (the Active Principle) may impress some thought or idea upon Anima Mundi, it is possible for the Individual Mind to impress some thought or idea upon the Vital Soul. 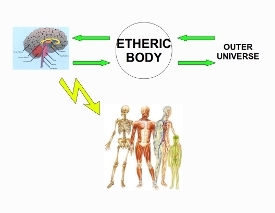 The Etheric Body is a concept that exists in various religions and philosophies, but, once again in a general sense, it is often considered the immediate intermediary link between the physical body and the so-called "non-physical" plane of existence. 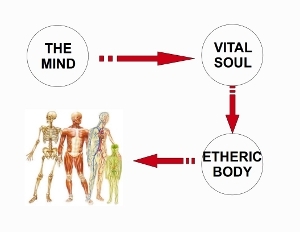 As its name implies, it is the medium through which vibrations in ether pass - either from some outside source to the physical body, or from the physical body to the external universe. If the reader would give the preceding points due consideration, it may serve to offer a viable explanation of certain observed phenomena related to the overall operation of the physical body. "Mens sana in corpore sano" - "A healthy mind in a healthy body"
There are, indeed other considerations that may be drawn from these observations of the mind body connection, but these will be addressed in more detail, in other sections of this web site. The following external web links may serve to provide additional reference material on the Mind Body Connection. Clicking on any of these links will open a new browser window.